Attentive to your needs and able to adapt accordingly, ROZO offers customised training programmes. – Are you looking to master the basic principles of Energy Savings Certificates? ISO 50001? Energy procurement? – Would you like to learn how to measure and monitor energy efficiency at your company? We can work with you to draft a training curriculum and procedures that are best suited to your needs: topic, number of participants, training media, types of instructional activities or workshops, level of instruction (beginner, advanced or expert), number of training sessions and more. Contact us for more information, so we can help create a training programme that’s tailored to your needs. ROZO can work with you on any topic relating to energy. 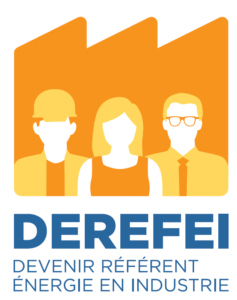 The DEREFEI training is designed to teach future energy advisers about basic concepts in energy and energy technology and provide the key principles of onsite energy management. The training, introduced by ADEME, is intended for those who make energy decisions, including company directors and accountants as well as personnel who manage QSE, production, maintenance, purchasing, new projects or (at more mature sites) ISO 50001. The training offered by Rozo places energy issues at the heart of the company, and offers solutions designed to improve long-term energy efficiency and financial performance. Illustrated by numerous actual scenarios tailored to your business sector (manufacturing, services, logistics, etc. ), the DEREFEI training includes a wide range of instructional methods (work in small groups, roleplaying, videos, online simulation and more). Build an energy management process. Mobilise the entire company behind energy efficiency issues. Monitor, analyse and report on consumption and proposals from suppliers and service providers. Keep track of new developments in the field of energy management. Identify deviations and implement appropriate solutions – and more. The training is given over a period of two or three days. The first day is devoted to Module 1, “Fundamentals”, and the second and third days are devoted to Module 2, “Procedure and Methods”. Module 1 is optional. A placement test is sent to participants in advance, to evaluate their level of knowledge and determine whether they can start the training directly with Module 2.